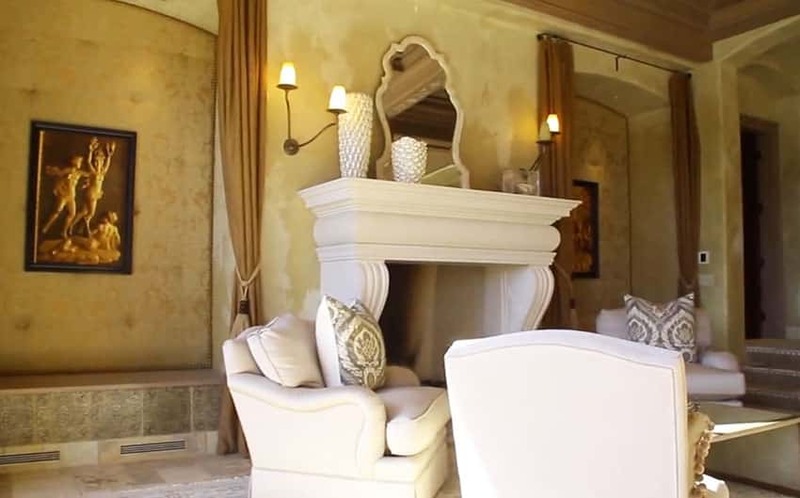 This Tuscan style home is representative of old-world rustic charm with gorgeous terra cotta tiles, textured walls, stone patio areas, and elegant details. 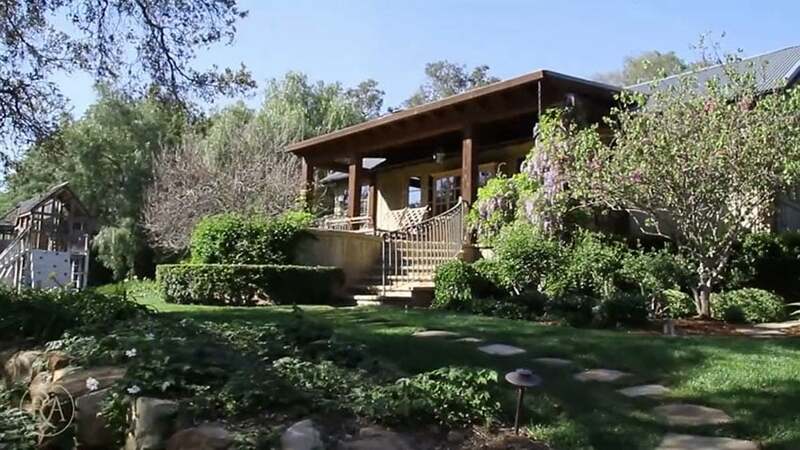 The house is situated on a beautiful 11 acres that overlooks the ocean and offers commanding views of the hillside from its high vantage point. 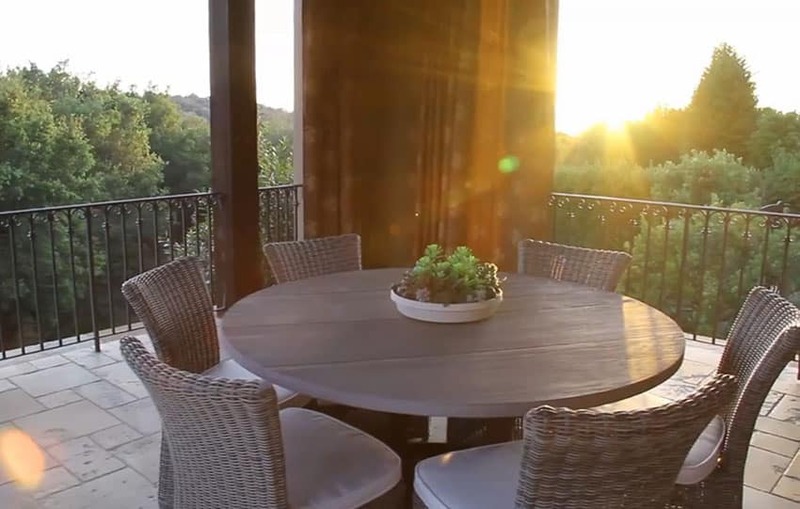 The home itself features 6 bedrooms and 8 bathrooms covering a total of 8,572 square feet of living space. Reminiscent of a true Tuscan villa this luxury home has multiple balcony and outdoor patios as well a large sparkling swimming pool and spa. A private guest house with upscale furnishings provides visitors with a perfect getaway all to themselves. 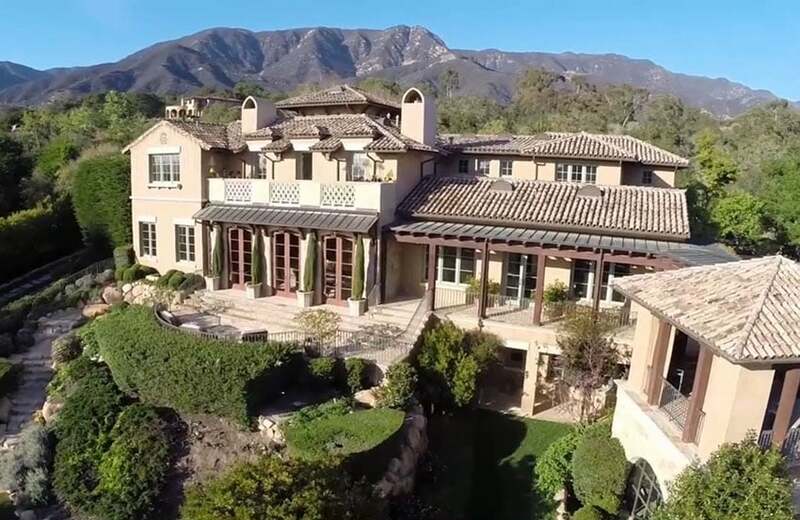 Generally Tuscan style home rely on earthy color palettes with detailed wood molding and iron railings and accents and this home is no exception. 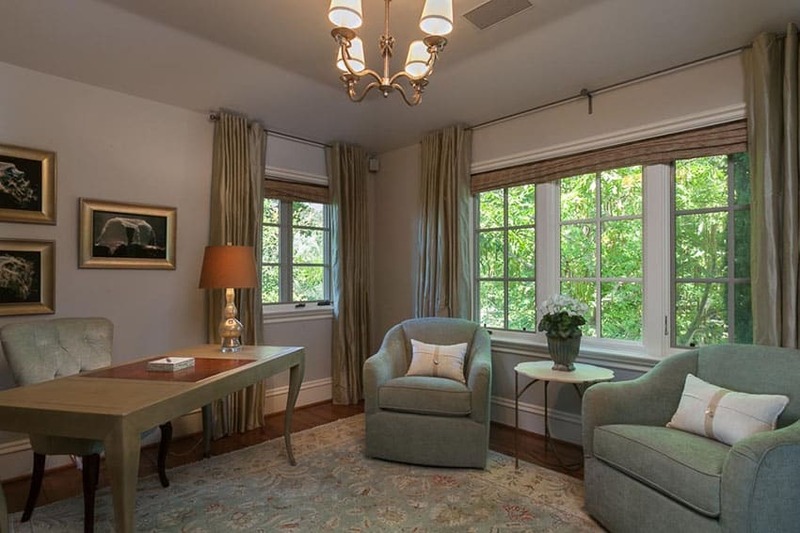 Walls are textured or left as rough plaster and large windows allow plenty of natural light. For lighting elegant wall sconces, chandeliers, and light fixtures of wrought iron are frequently utilized. Flooring of terracota tiles with mosaic inlays, or natural stone covered by antiue area rugs help maintain the old world style throughout. A lovely patio surrounds the stunning swimming pool with plenty of room for entertaining and relaxation. You can see the attention to detail of this Tuscan style home in the stonework and iron railing accents. 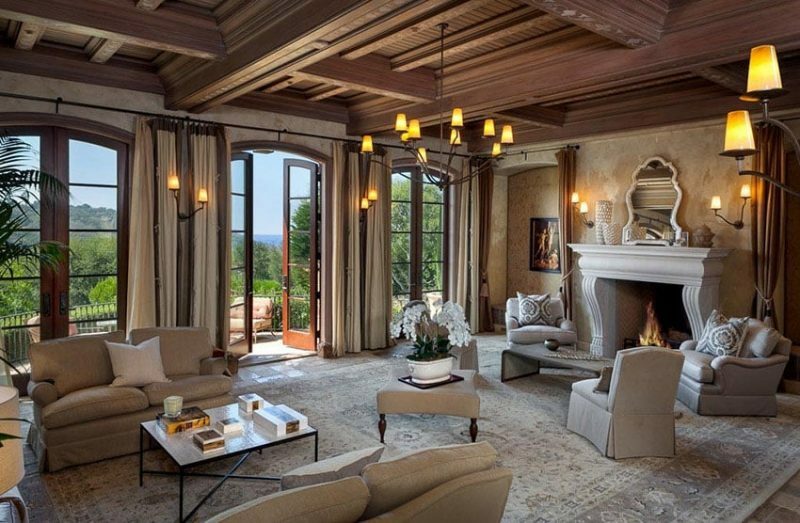 A luxury formal living room makes a grand impression with its large decorative wood burning fireplace, coffered ceiling , and expansive hill and ocean views. With a transitional design the kitchen opens to the dining area and another living room with a fireplace. This open layout is perfect for maximizing time with the family while preparing food or cooking. Detailed exposed wood beams and arches doorways continue the rustic upscale charm throughout the room. Elegant molding, decorative coffered ceilings and a detailed fireplace really stand out and give a feeling of elegance and sophistication. Large exterior doors offer sweeping views and provide plenty of natural light. 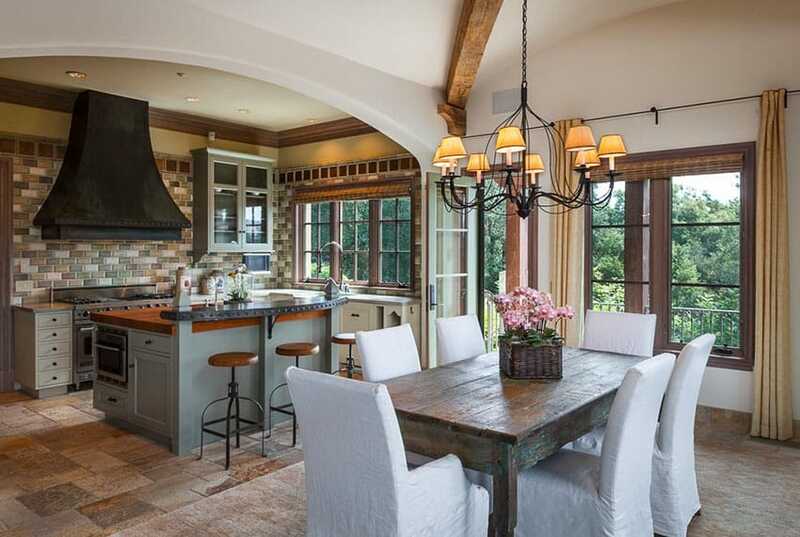 The rustic Tuscan style kitchen overlooks the dining area and provides an open layout for entertaining guests. 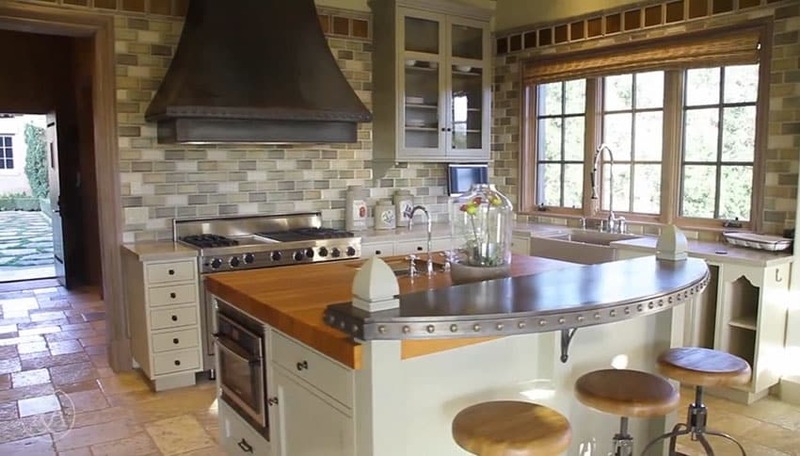 The kitchen features a stainless steel counter breakfast bar and wood butcher block surface island. In addition the room offers high end stainless steel appliances and luxury finishes such as the tile backsplash and glass faced cabinetry. 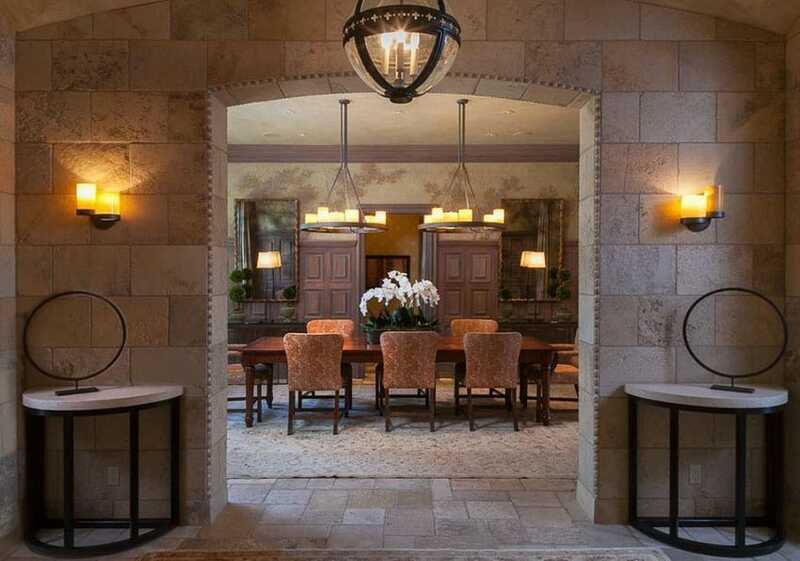 This grand entryway in to the formal Tuscan style dining room highlights the level of detail of this home. From the upscale wall sconces to the wood wainscoting, extra care has been taken in every room of the house. A closeup view of the formal dining room with its custom woodwork and rustic textured walls. Wood wainscoting and molding helps create an elegant and inviting ambiance. The large master bedroom is furnished in contemporary furniture with large windows and a light color palette to provide a calming space. 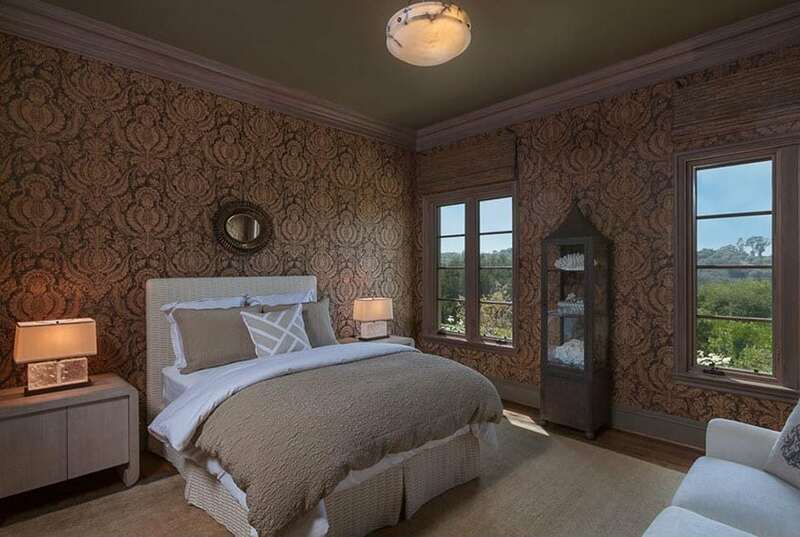 A guest bedroom with vintage design wallpaper and exciting views of the grounds and nearby hillside. The master bathroom suite features a large freestanding pedestal bathtub with traditional white cabinet vanity, tile flooring and painted open beam ceiling. This room is setup as an office with a large writing table, and comfortable chairs with large picture windows and a grey color palette. A closeup view of the decorative fireplace mantel surrounded by upscale furniture to create an inviting gathering spot. An outdoor balcony patio equipped with rattan chairs and a commanding view of the ocean and landscaped garden. 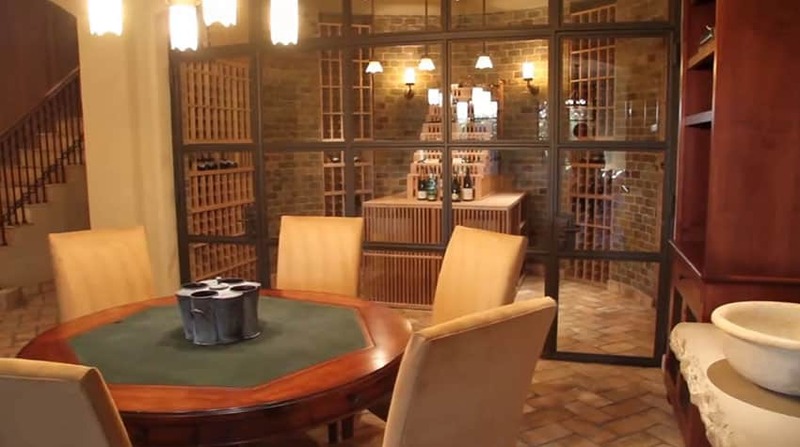 The basement features a large temperature controlled wine cellar with glass panes and a large storage capacity. 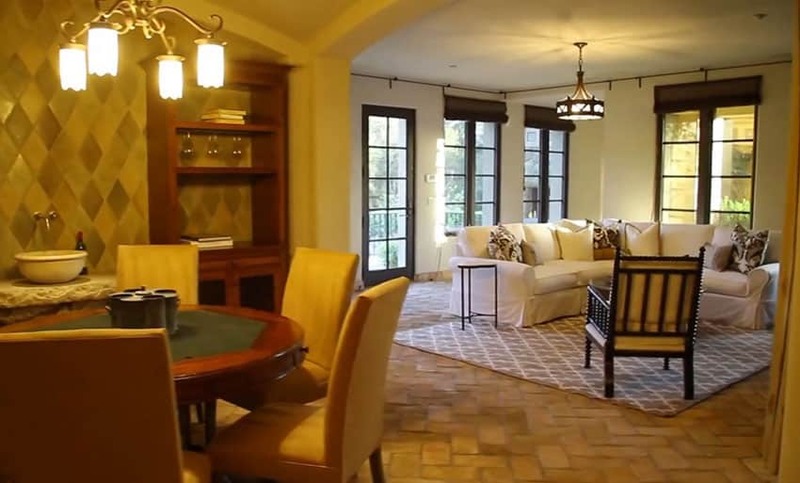 A nearby poker table makes this room a great spot to relax with friends and enjoy a friendly game or two. Looking from the wine cellar one can see in to another living space with a comfortable sectional sofa and doors leading to the outdoor patio. A game table is setup to create a luxury man cave with small home bar. A beautiful conservatory sunroom with a modern chandelier, large arched windows and an amazing view of the swimming pool and gardens. A stone pathway leading under a grand archway where one can find a fountain, garden and wood pergolas. A stone walkway winds through the garden to the front of the private guesthouse with a child playhouse in the background. 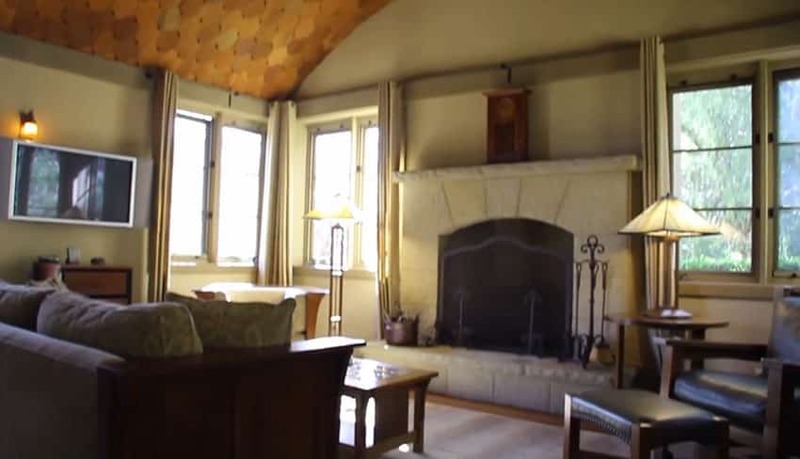 The guest house offers a cozy living room with large stone fireplace, arched ceiling and luxury furnishings. 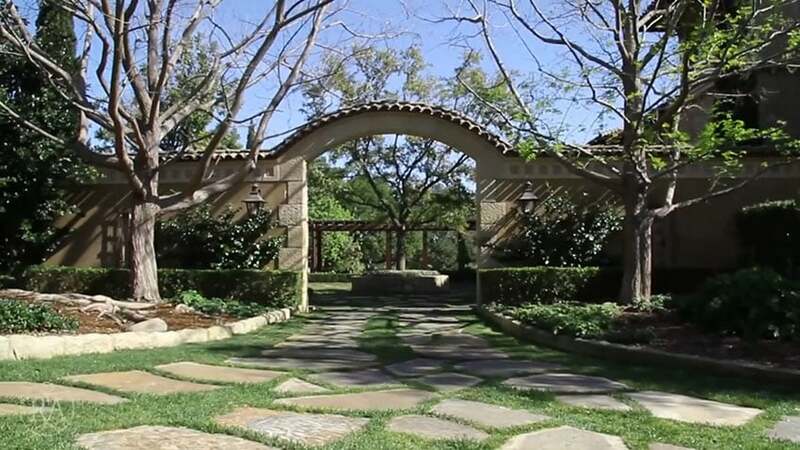 The exterior of the Tuscan style home with gorgeous gardens spread out of its eleven manicured acres. From this vantage point one can appreciate the lovely outdoor patio with its terraced gardens and wrought iron railings.